The islands of Makronissos (Long Island), or Makronisi and Giaros, are located in the Aegean sea of Greece, close to the coast of Attica, facing the port of Lavrio. Makronissos has an elongated shape; 13 km (8 miles) north to south, and around 500 meters (1,640 ft) from east to west, its terrain is arid and rocky. In ancient times the island was called Helena. It is part of the prefecture of the Cyclades but it is not part of that island chain. Administratively, it is part of the municipality of Kea. The islands are uninhabited. However, from the time of the Greek Civil War up until the restoration of democracy following the collapse of the Regime of the Colonels, they were used as places of imprisonment for the Greek communists, hosting hundreds of prisoners. Because of its history, it is considered as a monument of the civil war era; therefore the island itself and the original structures on it are protected from alterations. The straits between Makronissos and neighboring Kea are the site of the sinking, in 1916, of HMHS Britannic, sister ship of the RMS Titanic. Makronissos and Giaros have been recorded in Modern Greek history as places of exile and torture for thousands of political prisoners. 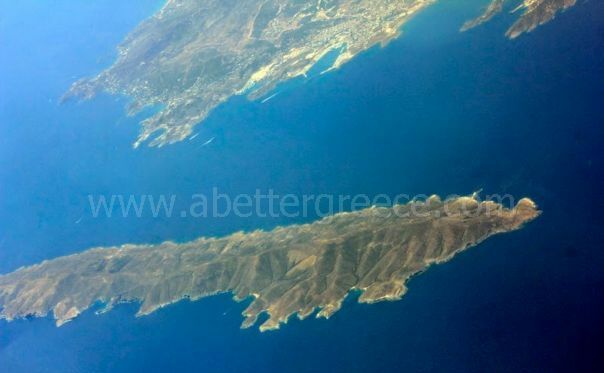 The two islands are not advertised nor are they promoted as they are shameful to the Greek people. Both islands are characterized as hellish, sweatshops, and also named the Devil’s Islands. Both islands are a black spot of shame in the culture of modern Greece. The establishment and operation of the concentration camps in both of the arid and uninhabited islands was a challenge not only for the feelings and the struggles of the Greek people, but also to the whole of the liberal world that fought hard to bring down fascism and their inhumane methods. It was spring of 1947 when three camps were created on Makronissos for enlistment Communists of Giaros for prisoners and Trikkeri for women. Makronissos, as it’s name also means in Greek has the shape of a long oblong. 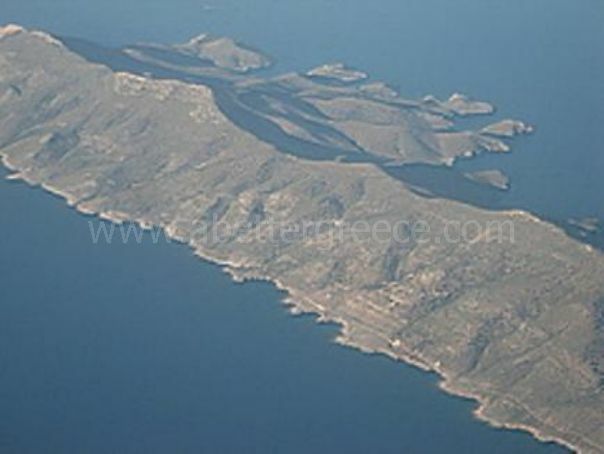 It administratively belongs to the island of Kea (Tzia), located across from Lavrio. In April of 1947 the first nine soldiers were transferred to the island, these soldiers were abandoned on Makronissos, a wild place, without water, without trees, just with many rocks. In this landscape, the soldiers found gravestones: they were the graves of the prisoners of the Balkan War, which in 1912 were abandoned on Makronissos and there, they died. These living conditions were later considered to be paradise to the soldiers after all that they went through later. In the autumn season of the year 1947, as the Civil war rages, more than 10,000 soldiers and non commissioned officers has been placed on the two islands. Three battalions pioneers were created, the first was: A ‘Special Battalion for Soldiers (EAGLE) , then the VETO and then the GETO. Beginning in the summer of 1946, the soldiers were asked to answer the question if they were Greek or not. And when then unsuspecting answered “yes “, then they were asked to sign a statement by which the National Freedom Front of Greece, the Communist Party of Greece and its “offshoots” would recant their beliefs. The carrying of heavy stones, the torment of their hunger and their thirst, the hard beatings, sometimes they were beaten to death, were on the everyday schedule. The Life in the three battalions was unbearable. But because the GETO, which was located on the southwestern edge of Makronissos, kept isolated the “most dangerous people”, there, the torture was even harder. However, the bloody events of the 29th February and of the 1st March 1948 that broke out in the AETO did not take place accidentally. In that specific battalion, life flowed on calmly. So , therefore, the prisoners had to be violently bent, in order for the whole camp to be terrified and then to be massively detached for recantation. The 4,500 soldiers of the AETO battalion were led on Sunday, February 29 to a mandatory church attendance, which was followed by a patriotic – religious preaching. Suddenly the guards at the word of the AM’s (the alpha mites is the acronym for the Police Unit in Greek) started to beat the prisoners until death. There were 17 dead and 61 seriously injured counted, while 155 others were arrested on the charges that they were referred to the military courts as the ringleaders. The ‘’cleansing” continued the following day. Eyewitnesses spoke of 200 dead people. Makronissos became the headquarters of the Military Prison of Athens ( S.F.A. in the beginning, and S.F.M. further along) and of the Organisation Penitentiary of Makronissos ( O.P.M. ). People awaiting military trials and courts, Greek police officers and the Middle East officers, who had taken part in the Movement of April 1943 were all led to prison. 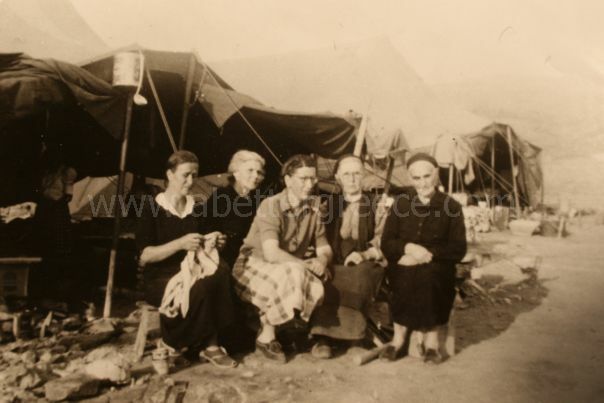 Exiles from Giaros island were now led to the Penitentiary, women from Trikkeri were displaced, teenagers and old people from Greek towns and villages. Cruel and creepy ways of arrest and torture were applied to these people, such as, placing a human being in a sac with a wild cat and then the sac being thrown into the sea, people being buried alive and the painful cutting off of the genital organs. One of the witnesses of the tortures on the island of Makronissos was Dimitris Tatakis, the Master of the Greek merchant navy. For fourteen months, he suffered the gamut of the torture, the deprivation and the cruel tests. He endured for thirty three whole days the torment of standing straight up. His torturers did not even give him drinking water. It is a fact that the application of the hard tortures of prisoners and mostly of those people that did not agree to sign the statement by which the National Freedom Front of Greece, the Communist Party of Greece and its “offshoots” would recant their beliefs, the unacceptable living conditions for a civilized country, the degrading behavior of the guards, officers and non commissioned officers towards the prisoners, was later recognized by the initiators and celebrators of the prison camp, that remains a stain on the political and military history of Greece. The chief commander of the Civil war himself, Alexander Papagos, recognized the need to abolish the island of Makronissos. He received a top-secret report from his friend and in April 1950, he sent it to the Prime Minister (at that time) Nikolaos Plastiras. In the month of June 1950 the reformatories were abolished and over 1,000 prisoners were discharged. For the other 23,000 inmates and prisoners of other places of exile, more time was needed for their discharge. As for the island of Giaros, it was used as a place of displacement for the political exiles since Roman times. Staying there and was actually considered a true hellhole. The island of Giaros or Poura, is located opposite and west of the narrow sea passage separating the island of Andros from Tinos. 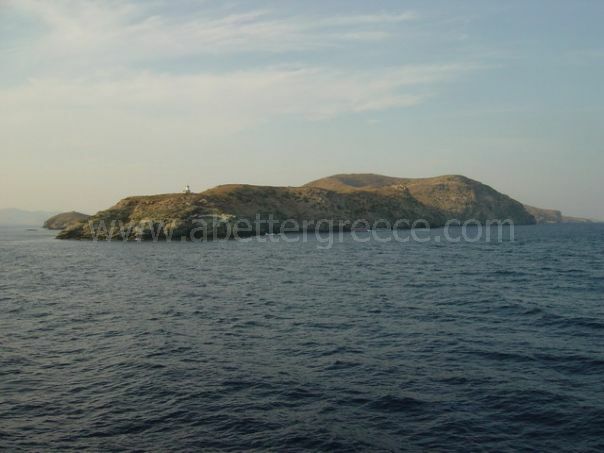 Since the year 1912, Giaros Island was administratively joined with the municipality of Syros. 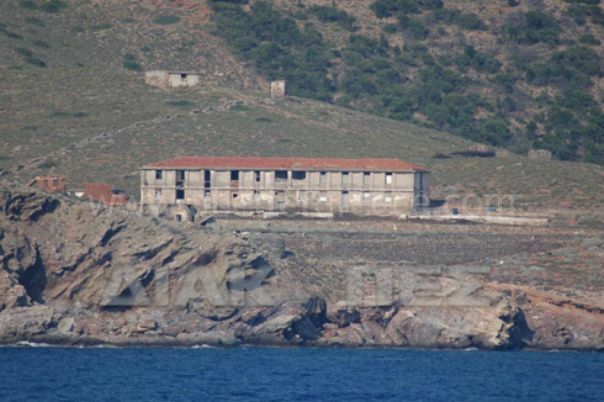 After the year 1930, but mainly during the period of the dictatorship of the 4th of August, Giaros Island started to be used as the restriction area for political prisoners. During the Civil War era (1946 -1949) the number of prisoners in the prisons that were built by the same prisoners, reached 7,163. Giaros remained the restriction area for political prisoners until the year 1961. Then the prison buildings were given to the General Navy Staff, to be used as warehouses and storerooms. Then the area around Giaros Island was marked as forbidden. With the establishment of the military fascist regime of 21 April 1967, Giaros Island reopened for the displacement of thousands of opponents of the regime. The last prisoners left the island in July 1974, after the policy change. Today Makronissos is a deserted, lonely island. The cruelty and the torture that happened there, in those years is not widely remembered, except for those who lived through these years. Although most of the Greek Islands usually make us think of the sun the sea, lively night life and seafood, the islands of Makronissos and Giaros prove to us that heaven could easily turn into a hell. Like the concentration camps in countries such as Poland and Germany, the islands of Makronissos and Giaros, should be open to the public with photographs and descriptions of the happenings in those terrible, shameful years, so that people understand about the political happenings and to make sure that history will not repeat itself. In Greek mythology, the island of Makronissos was the place of refuge for the beautiful Helen during the Trojan War, the island used to be called Helena in ancient years, for this reason. Makronissos is also mentioned in the famous Iliad of Homer.